Vintage Portrait of Stunning Strawberry Blond Child Image! Today I’m sharing this Vintage Portrait of a Stunning Strawberry Blond Child Image! 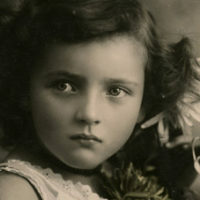 This appears to be a hand-colored sepia portrait of an adorable little girl in a striped dress. There is a wistful, far away look in her clear blue eyes. Her strawberry blond curls are held by a small head band. She has plump rosy cheeks and the hint of a smile. It would be beautiful framed as is or to use in your Craft or Collage Projects! « What is Gesso – a Comprehensive Guide!